Deal Physical damage to target enemy and inflict Target Lock for 2 Turns on a Critical Hit. This attack has +5% Critical Chance for each Rebel ally. 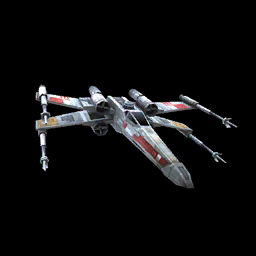 Biggs Darklighter's X-wing recovers 40% Protection and Taunts for 2 turns whenever an enemy becomes Target Locked. Enter Battle: Biggs Darklighter's X-wing gains Protection Up (30%) for 2 turns. Inflict Target Lock on target enemy for 2 turns, which can't be Evaded or Resisted. Deal Physical damage to target enemy and inflict Offense Down for 2 turns. Target Lock: Call a random ally to Assist.